Make sure to keep the fish fins moist until the very end so they do not dry and split. Always be extremely cautious working with chemicals, fiberglass and sharp materials. Do not rush the drying of the fish if you want it to look the best it can. People can do taxidermy on a fish because it is a prized possession, a nice catch or just because they like fish. It is prevalent among hunters and fisherman and can become very expensive if a professional has to do it for you. Learning how to do taxidermy for a fish yourself can be a rewarding and money-saving process. Take pictures of the fish when it is still alive or within a couple of minutes of its death to capture the detail of the body and colors. This will help when you have to paint the body later. Use a sharp filleting knife or taxidermy scalpel to cut a careful straight line across the lateral lines of one side of the fish. Cut the skin away from the flesh slowly and carefully. You are technically skinning the fish, but remember you need the intact skin later. Work from side to side. Slowly cut and peel the skin up from the middle to the top of the body, tail and head. Then pull all of the skin up to the head and pull it off like you would a glove or a sock. You will end up with a hollow fish with an intact head, cut down its side from the middle of the head to the tail. Make sure you have cleaned out as much of the meat as you can from within the skin to prepare for the chemicals. Remove the eyes and the brain. Inject a large syringe's worth of solution-based preserving materials such as glycol ethers or ethanol. Inject the tail and head portions of the fish, where there is the most amount of flesh. What solution-based preservatives you use depends upon the fish you are mounting; a registered taxidermist or fishing expert can be helpful in this step. Use a couple of large handfuls of powdered borax to thickly sprinkle the entire inside of the fish flesh for preservation. Rub some also along the inside of the head and tail. Rub in well and pay attention to cracks and crevices. Use a small bit of fishing line with a needle to sew up the flesh starting at the tail. Use regular stitches where you insert the needle, pull it around and put it up through the flesh, then repeat. Sew the fish about halfway up its side to the gills. Stuff sawdust into the bottom of the fish tail, slowly filling up the entire fish. Fill up every crevice you can with sawdust, using a small stick to make sure it is nice and tight. This creates the form of the fish how you want it. Stuff the head with wool and sawdust. Sew the remaining section of the fish up and tie and cut the thread. Shape your fish into how you want it to look, by lifting the tail and curving the body. You can carefully mold it sitting up. Then use a brush and sponge to remove all debris from the fish body so no sawdust dries onto the fish. This is very important because if it dries on the fish, it may ruin it. Position the fins how you want by using a thick cardboard or mount card and attaching it to the wet fins sticking straight out. FIll the eyes with a small bit of fiberglass to act like a foundation. Use a glass eye and insert it onto the fiberglass mold. 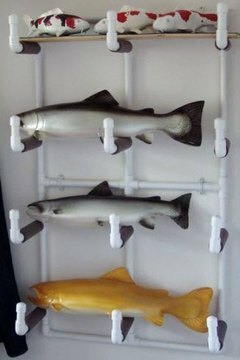 Let the fish dry for at least a month. It can take even longer to dry, but to look as realistic as possible it must dry slowly and carefully. Once dry, you can slather it with a coat of silicon to seal it and make it look more professional. Use the before pictures to paint the fresh bright colors, and you may varnish it if desired. Mount the fish on wood or metal for your wall.